I have not been as excited about a device as I was after taking the Garmin iQue M5 out of the box. For some reason (which I will try and lay out below) the iQue M5 made me extremely excited even before I turned it on. Garmin is a name that those in the Pocket PC community may only know of if they are aware of iQue like of Palm OS devices. Garmin makes a series of GPS devices including two Palm OS based handhelds. This year, Garmin made a change and introduced a Pocket PC handheld with an embedded GPS. 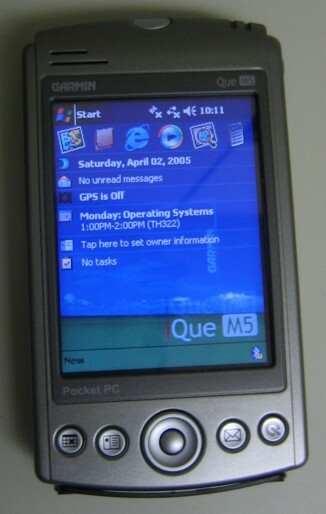 The iQue M5 is their first Windows Mobile device. Including GPS tracking software and downloadable map data, the Garmin iQue M5 combines the power of a full fledged GPS unit into a Windows Mobile based Pocket PC. 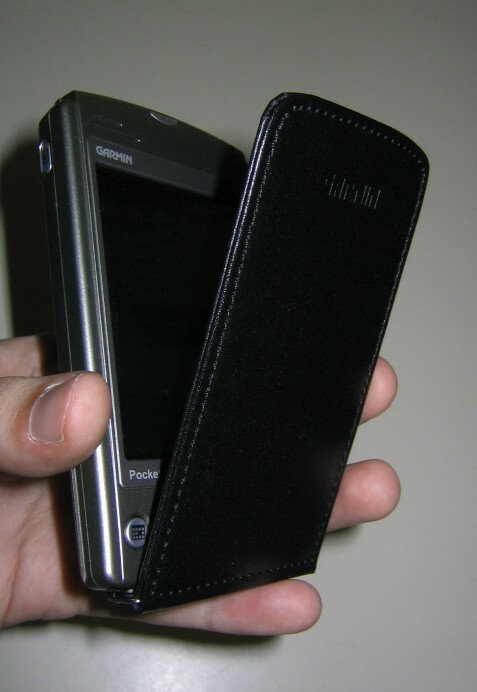 The Garmin iQue M5 is a relatively standard Windows Mobile 2003 Second Edition device. It is powered by an Intel XScale PXA272 processor running at 416 MHz. For storage it has 64 MB of RAM and ROM as well as an SDIO slot for addition memory or expansion cards. Bluetooth is included for connectivity to other devices and IrDA for simple communication. 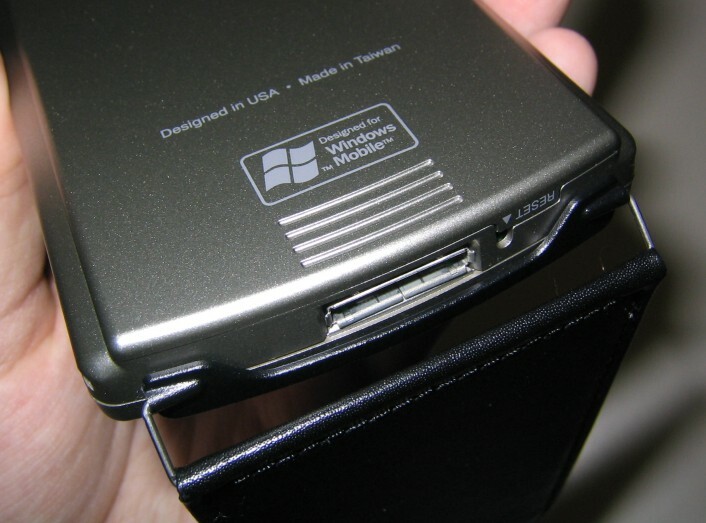 The screen is a standard Pocket PC screen, running with 16-bit color at 240 x 320 pixels. The device is almost 3/4 of an inch thick and weights just over five ounces. 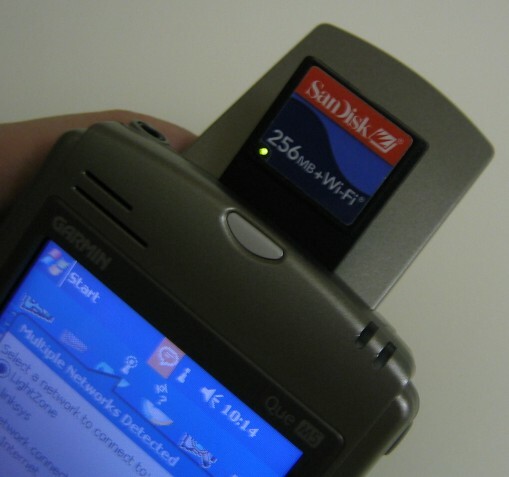 This device contains a unique feature, a 12-channel GPS receiver with a dedicated 48 MHz ARM7 coprocessor. It can connect to up to twelve satellites via a flip up antenna and supports both standard and DGPS (WAAS) accuracy settings. The coprocessor allows the GPS to deal with much of the GPS functionality on its own so the XScale processor can focus on mapping and/or PDA functions. The GPS can be interfaced via any of the devices connectivity methods (USB, IrDA, and Bluetooth). The minute I picked up the iQue M5, I really fell in love with its feel. Interestingly, the M5 is relatively standard looking so I really was not expecting it to "fit" any different in my hand. The first thing that is immediately noticeable about the devices style is the flip cover. While the M5 does not come with a case, the flip cover works to protect the screen while it is in your pocket. It also covers the quick launch buttons on the face of the device so they cannot be accidentally pressed. The cover flips all the way around to the back of the device so that it does not get in the way while you are using the device. Although the M5 is not the smallest device on the market, for some reason it just seems to be the right size. Not to thick, not to wide. It slips easily into my pocket (even with my MPx220) or a small backpack pocket. The device has a darker metallic finish, almost looking gold in some light. The front face is simple, with the power button at the top with the speaker just below, between the button and the screen. To the left of the power button is two notification lights, one for Bluetooth and one for power and other notifications. The screen is outlined by a dark grey border and just below the screen is four quick launch buttons, the directional pad, and the action button right in the middle of the d-pad. The action button is actually a button which is nice to separate it from being molded in to the direction pad. The directional pad itself is circular and is easy to use for navigation. The sides of the device only include two things. On the left side is the record button and on the right is an external antenna connector. Sometimes the sides get cluttered with buttons, so it was nice to see Garmin kept them clear. Maybe that is what I like about the device, the simplicity. The bottom of the device has a sync power that doubles as an AC outlet. The soft reset button is also on the bottom of the device. On the top of the M5 is a standard headphone jack, SD/SDIO card slot, and infrared port. About 1/3 of the back side of the device is the GPS antenna. Also on the back is access to the battery, stylus, and a switch for unlocking the GPS antenna. The device thickness increases from the bottom to the top of the device to make room for the additional size and shape of the embedded GPS antenna. When it comes to being a PDA, the Garmin iQue M5 is a relatively standard device. It is great that it is based around Windows Mobile 2003 Second Edition so you get the extra features of Second Edition such as the ability to change into landscape mode. The size of the device makes it very easy to hold when writing and and for general use. Plus, since the screen cover wraps around the device it is easy to hold even with the cover. At 50% brightness, the device is still extremely useable, and the screen is very clear and easy to read for general indoor use. One of the things the M5 does not include, which has become common place for most mid-range devices, is WiFi. While the M5 is more about the GPS than about the PDA use, I think WiFi would have been a great solution especially if mapping data was available online. If nothing else, SDIO is included which means I was able to load in a SanDisk Connect Plus SDIO card for accessing the world from the device. Also, the memory is limited, especially considering when you may have to use the internal for GPS data. Garmin is the first company to make PDA's with an embedded GPS. 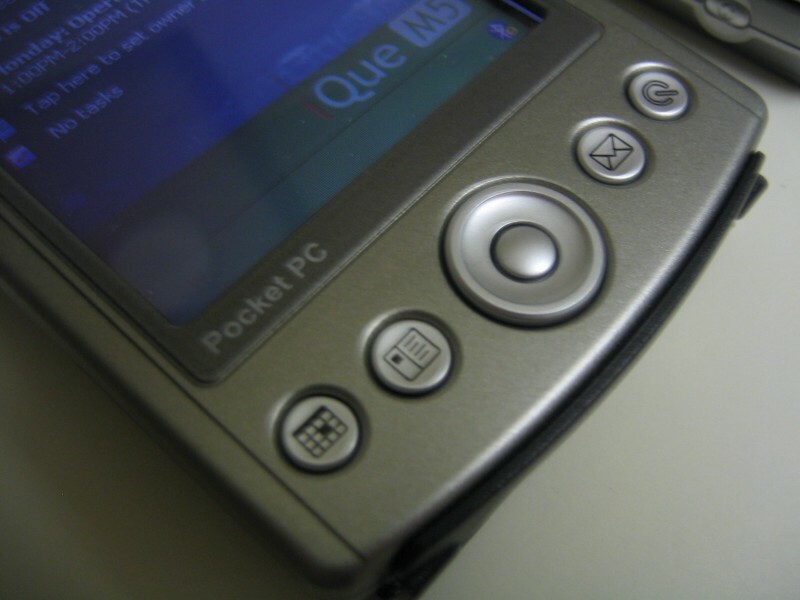 The M5 is their third PDA/GPS unit, and their first running Windows Mobile. Instead of having to buy a GPS accessory, the unit is embedded just as the Bluetooth is, with the only difference being the external antenna. About 1/3 of the back of the M5 is the external antenna. In order to use the GPS, the antenna must be raised, which is done by unlocking it via the switch next to the antenna. When the antenna is unlatched, GPS positioning software automatically begins running on the device. The external antenna is needed so that satellites can be "seen" by the device. Initially, it takes the device a couple of minutes to locate the position, but normally it will take less than a minute to lock on to satellites and locate where you are. As with any wireless technology, it is an additional drain on the batteries. Garmin really plugged the GPS system right into Windows Mobile. First of all, there is a notification icon showing not only the status of the GPS but if you expand the notification bubble, other system status meters will be listed including brightness and battery life available. When the GPS is active, the current location will be listed on the Today screen allowing for instant notification of where you are. Garmin has included a full suite of applications for using the GPS. Things start off simple, with an application that simply tracks how far you have traveled and your speed, but QueMap is also included, which is a full mapping client. QueMap is based on MapSource City Select maps, and included with my M5 was the North American maps. Initially the M5 has major highways for North and South America but for more detailed mapping, specific maps must be loaded. MapSource is the same software Garmin uses with many of their other iQue and StreetPilot products. QueMap is not the most advanced mapping software I have seen, but it takes a simple approach to mapping and has a number of features which helps with navigating. Maps are loaded from a desktop computer running the MapSource software. Once you get the hang of the software, it is very easy to select by pointing at parts of the map that are needed. Maps can be stored anywhere, including on memory cards. The software will automatically detect which maps are available and will display them from multiple locations. The internal memory is enough to hold about one state (depending on its size of course). While the QueMap software may be simple in style, it is easy to use and set up driving directions. It only took a couple of seconds to setup a route, and with the GPS always available to the device, it is very easy to mark your current location. One question I had with the M5 was its level of accuracy. I enabled WAAS to allow for more accurate positioning as when I was using the device by hand, I sometimes worried about the accuracy. The included software will tell to the accuracy, though I worried that 25 feet was a little to inaccurate (but it is within the specifications of the device). For geocaching, this may be an issue, but on the road it was better. Sometimes the software would get a little delayed...I do not know if this was the main processor lagging, the screen not repainting fast enough, or the GPS itself. This sometimes caused the QueMap software to not quickly notice I was driving off course (sometimes taking up to two blocks) and then it also had to take time to replot the map. The system was only slightly slower than others I have used, and I blame the rerouting on the processor speed of the device. I do have to say, I like the graphics QueMap displays when you get close to a turn. It makes it very bold and easy to see where a turn is. QueMap includes standard "heads-up" information including your speed and distance to the designation on the map. Additional, QueMap makes finding address very easy by showing you approximately what address you are at for your current location. Also a nice feature was the automatic zooming during directions, which gives the navigator a sense of how far they will have to travel until the next turn by zooming the map to show the whole leg of the route. Of course QueMap will talk to you as you drive telling you when and where to turn. I was amazed by the amount of stuff in the box with the iQue M5. In the box is, of course, the device, battery, a set of CD's, and manuals. Also, as expected, there is an AC power adapter (which plugs into the cradle or the device) and a cradle. Before I get to what else was included, I want to touch on the two items I just listed. The AC power adapter is nice because it includes a flip down set of prongs, which is great for portability. The cradle I absolutely love. It is extremely simple yet has a very nice style, and is defiantly effectively sized and weighted. The sync connector and device holder is small compared to many other cradles I have used, and are mounted on a simple arched piece of metal. As I said, nice style. But what I never would have expected is that Garmin includes a second cradle with the device. No, it is not a cradle for your office...unless your office is in your car. There is no need with the iQue M5 to buy a special mount to hold the device, Garmin has provided the same style cradle for the car as it does for near your computer (but without the base). It tilts up and down, and left and right. You can mount it via the suction cup either to the windshield or in some cars you can stick it right on the dashboard. The car mount also includes a power adapter, allowing the device to be powered by the cigarette light, and on the power adapter has a speaker for enhancing feedback from the device for navigation. The days of black-and-white GPS screened units should be over. A PDA user that also needs a GPS will not want to look any further than the Garmin iQue M5. 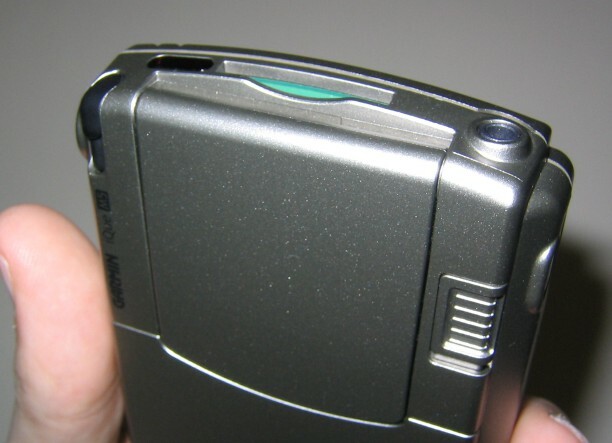 The M5 combines the functionality of a standards Windows Mobile PDA with a GPS, giving the user dual functionality. The device has a simple style to it and simple software. The solution is not over the top of complicated, but intuitive and powerful. 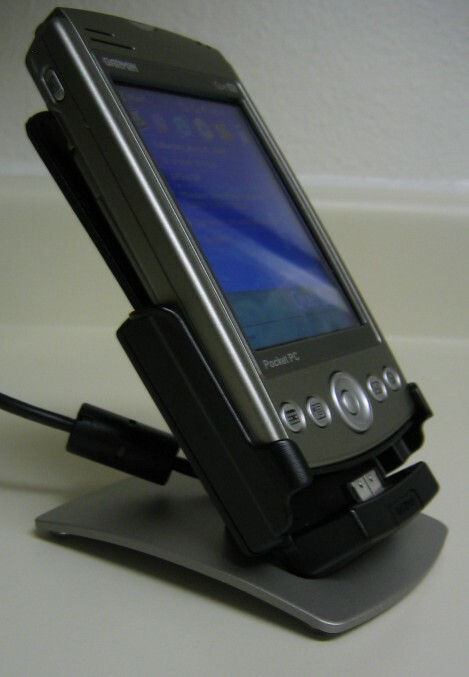 The iQue M5 is an example of how technology should be integrated into a Windows Mobile device. It does not overpower the standard functions, but is available quickly and easily without the need for additional accessories. However, the M5 is not a cheap PDA. Priced at $750, the M5 could be considered a $550 PDA with a $200 embedded GPS unit, making it a device that should be considered by those that need equally to have their PDA and GPS with them at all times. Notice, using the link below the M5 can be found for as low as $550, making it an much better deal for a user that would like the GPS functionality, but may not be using it as often. For the price, I would have expected a little more power (processor and memory) from the M5, but the style is great and I am still a huge fan of the device. Military baseball caps wholesale . https://odaiba777.com . Learn about windows 8 data recovery for you.